Aside from its many heart-healthy attributes, garlic bulbs contain high concentrations of remedial sulfur compounds that make it superb complement to health and wellness. As one of the more powerful of these compounds, Scordinin may be responsible for many of garlic’s renowned effects. 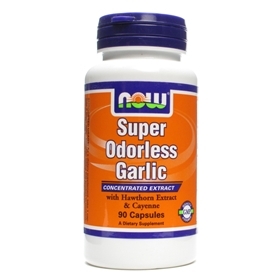 NOW Super Odorless Garlic is our most potent formula and delivers a robust 5000 mg per serving – the equivalency of one whole clove. To enhance the synergistic performance, we’ve included Hawthorn and Cayenne. Garlic's use dates back thousands of years as both a traditional medicine and a seasoning. Traditionally, garlic has been an integral part of the Mediterranean diet and many Asian cuisines. Garlic helps to lower cholesterol, fight cancer, lower hypertension, help with diabetes, arthritis & Alzheimer’s disease and infections, including the common cold. It is anti-viral, anti-fungal, and anti-bacterial. Garlic contains many compounds that have been linked to a host of proposed health benefits. One of the key components is allicin, a sulfur compound formed in raw garlic after a clove is cut or crushed. Allicin is the major source of the bioactive compounds that provide garlic’s strong taste and smell. But not all scientists agree that allicin itself is the main beneficial ingredient, since it breaks down quickly into other compounds. In fact, no one knows which, if any, component is most important, and different ones may have different effects in the body. Suggested Usage: As a dietary supplement, take 1 capsule 2 times daily. Consider taking this product in combination with NOW Immune RenewT and Chlorophyll.